A multimedia kit for using a “technology of consciousness” to transform your life. Science has spent centuries trying to define the laws of the universe. But in this modern era of breakthroughs and quantum physics, what have we finally learned? “It turns out that the laws of the universe are just waiting for us to break them,” explains Richard Bartlett. With The Matrix Energetics Experience, this extraordinary teacher invites you to learn the art of rewriting any rule of your reality—about your health, your happiness, or even your understanding of what is physically possible. As quantum physics implies, we live in a universe made of consciousness and light, where what we think of as “real” can shift as quickly as our minds let it. Now Richard Bartlett takes you on a freewheeling, playful,and possibility-expanding journey that will shatter your preconceptions about the seemingly “solid” universe we live in—and how unlimited your potential to change it truly is. 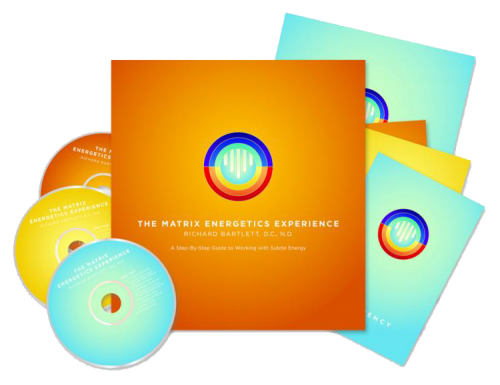 If you are ready to embrace a reality where anything goes, miracles happen, and nothing is beyond your reach, then you are ready for The Matrix Energetics Experience. Richard and Melissa are Amazing, funny!, and totally Deliver! Awesome course! 5 stars! I bought Richards two books, his audio Into the Matrix and this one. I bought Melissa's M-Joy book and loved everything I have, totally worth it! One wish!, As I (Along with many others I'm sure) cannot afford to go to and stay at an actual event, I can save and get these. I know richard offers multible advanced courses, anyway you can please package those for sale like these? Love it as much as I thought I would. Suggestion: Bartlett's demonstrations would have more credibility if it also showed one of his students performing it successfully.